How far would a person go to discover the truth? What concessions would be made along the way if that truth ran counter to what had been taught and accepted as the definitive way of life both culturally and socially? These are just a few of the many questions that will arise in the mind of those placed inside the visual retelling of the crucifixion and resurrection of Jesus in the film Risen. Unlike many films that have focused on excerpts from the New Testament, Risen chooses to bring the viewer into this story through the lens of a hardworking, driven, high-ranking Roman soldier. 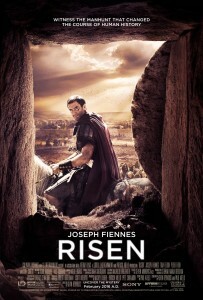 The viewer’s first encounter with Clavius (played by Joseph Fiennes) sets the tone for the remainder of the movie. Quick and unwavering, Clavius’ skills in battle highlight his character development as cunning, resourceful, and preternaturally surefooted. His military rank and consistency in achieving outcomes that are beneficial to the Roman cause, speak volumes in his frequent interactions with Pontius Pilate (Peter Firth). Tasked with keeping order in the kingdom, Clavius is sent for crowd control in the crucifixion of three men, including Jesus. The film spends little time on the gruesome scene, but the audience quickly sympathizes with the horrific pain that many endured from this form of death. As the struggle for power unfolds, Clavius must balance the interests of both the Jewish leaders and the Roman authorities when it is discovered that the body of Jesus is missing from the tomb. The corruption of the leaders is revealed when Clavius finds out that certain parties used bribes to re-establish religious and social control. This was done in an effort to diminish the following that Jesus had acquired. The search for the truth puts Clavius and his newly appointed aide Lucius (Tom Felton) into a frantic but systematic unearthing of information, in hopes to disprove the claim of a resurrected body. With his position on the line, Clavius must make sense of the things he has seen and heard while reconciling those with his own thoughts and feelings. The overall pace of the storyline lends a certain documentary-style flair to the film. It keeps the viewer’s interest, but not in the typical action-packed, over-the-top sequences intended to satisfy the ever-shortening attention span. The content is just enough to satisfy curiosity while keeping those familiar with the Biblical narrative appeased in the visual and historical preservation of the story. For a film that is easy to follow a well-known story line, there is much depth and substance if one is willing to look for it. Bottom Line: While Risen will not gather the attention and acclaim of a mega-dollar Hollywood blockbuster, it quietly asks the question of what really remains important to us throughout our lifetime. Fame? Fortune? Friends? Or is it something that can’t be bought, earned, or persuaded? As with the story of the resurrection, there is so much more to Risen that what can be seen on the surface.